Figure 1: Schematic of the experimental setup. The energy of the incoming beam is measured by the gas-monitor detector (GMD). The beam is focused onto the sample with an off-axis parabola (OAP) coated with a Mo/Si multi-layer optimized for 13.5 nm wavelength (92 eV photon energy). The transmitted energy through the Al sample is measured by a silicon photodiode. Figure 2: Atomic force microscopy picture of a damage crater in PMMA created with a single FEL shot at 13.5 nm focused with the OAP. Figure 3: Transmission of aluminium target as function of fluence. The circles represent the experimental data points; the solid line is the theoretical prediction (for more details please refer to the published paper). The dashed curve is the predicted temperature in electronvolts (right Y-axis) in the valence band after the FEL pulse has passed, but before the L-shell holes are filled and the Auger recombination heats the band further. Figure 4: Recorded X-ray emission spectra from aluminium at three different fluences. Shown is the radiative recombination of the valance band to the LIII and LII levels. The spectra have been fitted resulting in different electron temperatures (1.2 eV, 0.5 eV, and 0.1 eV). The spectra are offset for clarity. 1 Depart. of Physics, Clarendon Laboratory, Univ. of Oxford, Parks Road, Oxford, OX1 3PU, UK, 2 Inst. f. Optik u.Quantenelektronik, Friedrich-Schiller-Univ., Max-Wien-Platz 1, 07743 Jena, Germany, 3 DESY, Notkestrasse 85, 22607 Hamburg, Germany, 4 Lawrence Livermore National Lab., 7000 East Avenue, Livermore, CA 94550, USA, 5 Inst. of Physics, Polish Academy of Sciences, Al. Lotnikow 32/46, 02-668 Warsaw, Poland, 6 FOM-Inst. for Plasma Physics Rijnhuizen, NL-3430 BE Nieuwegein, The Netherlands, 7 SLAC National Accelerator Lab., 2575 Sand Hill Road, Menlo Park, CA 94025, USA, 8 Inst. of Physics, Academy of Sciences of the Czech Republic, Na Slovance 2, 182 21 Prague 8, Czech Republic, 9 GoLP/IPFN, Inst. Superior Tecnico, 1049-001 Lisboa, Portugal, 10 Inst. f. Physik, Univ. Rostock, 18051 Rostock, Germany, 11 CFEL, DESY, 85 Notkestrasse, 22607 Hamburg, Germany, 12 Univ. Hamburg, Luruper Chaussee 149, 22761 Hamburg, Germany, 13 Queen’s Univ. Belfast, University Road, Belfast, BT7 1NN, Northern Ireland, UK, 14 UPMC, 4 place Jussieu 75005 Paris, France, 15 Lawrence Berkeley National Lab., 1 Cyclotron Road, CA 94720, USA, 16 Depart. of Physics, Kohat Univ. of Science and Technology, Kohat-26000, NWFP, Pakistan, 17 Depart. of Physics, 366 LeConte Hall, Univ. of California, Berkeley, CA 94720, USA, 18 SOLEIL, L’Orme des Merisiers Saint-Aubin, BP 48 91192 GIF-sur-YVETTE, France, 19 Inst. of Materials Research, Slovak Academy of Sciences,Watsonova 47, 040 01 Kosice, Slovak Republic, 20 European XFEL Project team, DESY, Notkestrasse 85, 22607 Hamburg, Germany. Published as: “Turning solid aluminium transparent by intense soft X-ray photoionization”, Nature Physics doi:10.1038/nphys1341. 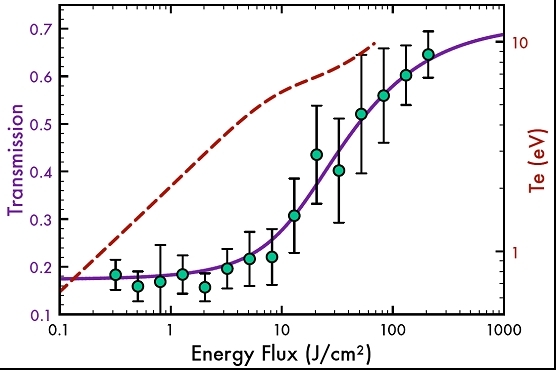 The free-electron laser FLASH at DESY when focussed to ≤1 µm spots reaches record intensities over 1016 W/cm² in the soft X-ray wavelength regime. In an experimental campaign FLASH, at photon wavelength of 13.5 nm, reached these extreme intensities leading to the saturation of the absorption of an L-shell transition in aluminium: the samples become transparent for soft X-rays (at 92 eV photon energy). This has never been observed before and is an ideal method to create homogenous warm dense matter (WDM), which is highly relevant to planetary science, astrophysics and inertial confinement fusion. A well-known phenomenon in the visible and near-visible region of the electromagnetic spectrum is saturable absorption, where the absorption of light decreases with increasing intensity . With the new FEL light source FLASH at DESY, due to the short pulse duration (~15 fs)  and the high intensities (up to 1016 W/cm²) with ~1µm focusing, it was possible to saturate an L-shell transition in aluminium. The aluminum sample predominantly absorbs the 92 eV photons via L-shell photoionization and becomes transparent during the duration of the FLASH photon pulse. Because of the high intensities the photoionization rate surpasses the recombination rate, leading to a severe depletion of the inner-shell absorbers. This process leads to the storage of ~100 eV per atom which in turn evolves to a warm dense matter state reaching temperatures of about 25 eV by subsequent Auger decays. This leads to highly uniform warm dense matter condition, which is of great interest in high-pressure science , the geophysics of large planets , astrophysics , plasma production and inertial confinement fusion . 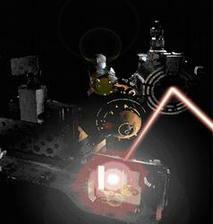 The experiment has been performed at the FLASH beamline BL3. The collimated FEL beam was focused onto 53 nm thick solid aluminium samples using a Mo/Si multilayer-coated off-axis parabola with a focal length of 269 mm . A schematic of the experimental setup is shown in Fig. 1. 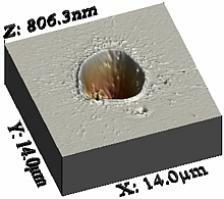 The best focus was determined by using Nomarski optical microscopy and atomic force microscopy (AFM) to look at damage craters induced by irradiating polymethyl methyacrylate (PMMA) at low FEL fluences . With this method the focal spot size at best focus has been determined to 1.5 µm. A sample picture of an irradiated PMMA sample is shown in Fig. 2. By changing the FEL pulse energy and varying the sample position, three orders of magnitude of FEL fluence were scanned. The transmission of 53-nm-thick aluminium was measured as function of FEL fluence using the silicon photodiode. The measurements were done on a single shot basis irradiating always a fresh, non-irradiated aluminium sample. The resulting transmission curve is shown in Fig. 3. At low fluences (~1 J/cm²) our experimental transmission data matches very well with the values one would expect for transmission through 53 nm thick cold aluminium taking into account 10 nm thick aluminium oxide layers on either side of the sample . At higher fluences (3-200 J/cm², with a pulse duration of ~15 fs this corresponds to a maximal irradiance of 1.5•1016 W/cm²) the material becomes more and more transmissive (up to 65%). At these intensities, the fraction of aluminium atoms with an L-shell hole is very high. Since the missing L-shell electron does not screen the atomic core any longer, the L-edge of the atom increases to 93 eV. Therefore the FEL is not able to eject a second L-shell electron, which leads to a quenching of the bound-free absorption. Thus, the only absorption will be due to free-free absorption where the coefficient is about two orders of magnitude lower. The lifetime of the L-shell hole is estimated to be around 40 fs, significantly longer than the FEL pulse duration, but short compared to the electron-phonon coupling times (~1 ps), or hydrodynamic motion (>1 ps). The hole will be refilled by means of either radiative decay, or the dominant Auger decay. This Auger decay leads to the heating of the electrons (up to 25 eV at highest fluences, corresponds to 290 000 K) which were, after the FEL pulse has passed the sample, relatively cold (up to 9 eV at highest fluences). 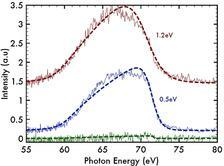 Information about the electron distribution can be inferred from soft X-ray emission spectra. In a separate experiment such spectra have been measured at relatively low fluences (0.04 J/cm², 0.3 J/cm², 0.6 J/cm²) and are shown in Fig. 4. The spectra show the radiative recombination of the valence band electrons into the LIII and LII levels. The emission ranges from ~62 eV (energy difference between the L levels and the bottom of the valence band) to a thermally broadened region at an energy corresponding to the difference between the Fermi energy and the L-shell (an energy of around the L-edge at 73 eV). The thermal broadening at higher fluences (temperatures) is clearly visible. In summary, we have created a very transient exotic state of highly (to 100% singly) ionized crystalline matter. This allows us to create very homogenous warm dense matter conditions: for example at a fluence of 100 J/cm² (50% of the FEL pulse is absorbed) the temperature difference between the front and the back of the aluminium is calculated to be only 5%. What needs to be further explored, is how this state finally evolve into equilibrated WDM. However, physical properties of this exotic state are largely unknown. Therefore accurate measurements of electron-phonon coupling times, ion-ion interactions, as well as spectroscopic measurements in the VUV and soft X-ray range at these WDM conditions are still needed. G.N. Lewis, D. Lipkin, and T.T. Magel, Reversible photochemical processes in rigid media. A study of the phosphorescent state. J. Am. Chem. Soc. 63, 3005-3018 (1941). W. Ackermann et al., Operation of a free-electron laser from the extreme ultraviolet to the water window. Nature Photonics 1, 336–342 (2007). R. Davidson, Frontiers in High Energy Density Physics: The X-Games of Contemporary Science. (National Academies Press, 2003). T. Guillot, Interiors of giant planets inside and outside the solar system. Science 286, 72-77 (1999). M. Turner, Connecting Quarks with the Cosmos: Eleven Science Questions for the New Century (National Academies Press, 2003). J.D. Lindl et al., The physics basis for ignition using indirect-drive targets on the National Ignition Facility. Phys. Plasmas 11, 339-491 (2004). J. Chalupský et al., Characteristics of focused soft X-ray free-electron laser beam determined by ablation of organic molecular solids. Opt. Express 15, 6036-6043 (2007). B.L. 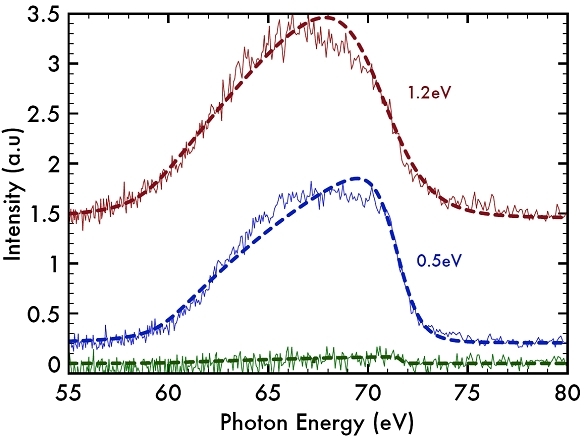 Henke, E.M. Gullikson, and J.C. Davis, X-Ray Interactions: Photoabsorption, scattering, transmission, and reflection at E=50-30,000 eV, Z=1-92. Atomic Data Nucl. Data Tables 54, 181-342 (1993).